BALTIMORE (WBFF) - On Friday, hundreds in Baltimore’s Orthodox Jewish community turned out to Shomrei Emunah synagogue for a free measles vaccine clinic. The Baltimore City Health Department helped put it together with Sinai Hospital and local leaders in just a few days after confirming last Friday a child in Pikesville has the measles. Doctors and Jewish community leaders have been urging adults to make sure they and their children are up to date on their vaccines Friday’s clinic was mainly for adults. It started at 10 in the morning. They had a steady stream of people during the day. “You have hundreds of people going in there,” said Rabbi Eliezer Lachman. “There was a long, long line,” said Judy Zapinksi. So many are coming because of the confirmed measles case in Pikesville and the outbreaks in other parts of the country. A video posted on the website of Baltimore Jewish Life features a rabbi talking about what happened in Detroit after one person with the virus visited several synagogues there in March. “Several of us had pneumonia, bronchitis, hearing impairment, vision impairment which went on for two weeks,” said Rabbi Tzali Freedman. Baltimore's Orthodox Jewish community has a very high vaccination rate. But many adults between the ages of 30 and 62 only got one dose of the vaccine. Current guidelines now call for two. “I and most of the 41 others from the community who came down with measles had only received a single first generation vaccine,” Freedman says in the video. A second dose ensures you're 97 percent percent protected from the measles. With so many people expected to travel next week for Passover, Jewish leaders and local doctors have been urging adults to make sure they have that second dose. “To ensure those people traveling to areas with outbreaks or receiving visitors from areas with outbreaks receive a second vaccine,” said Dr. Adena Greenbaum, who is with the city health department. Baltimore's turnout shows just how seriously the community is taking this. “It’s incredible that people care so much about their health,” added Chaya Braun. 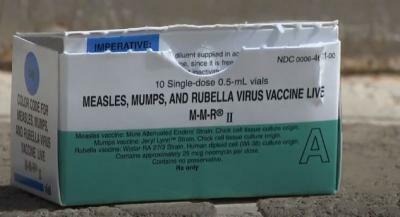 A local rabbi told FOX45 that the Pikesville child with the measles is doing okay. He had one of the two doses of the vaccine and was exposed to the virus while traveling. Because of the incubation period, doctors in Maryland are still following protocols and monitoring for more possible cases.